We had a great time hosting the folks from @WholeFoodsParamus yesterday. We love working with Whole Foods because a large part of their mission focuses on promoting locally grown food from local farmers like ourselves. They seek to create transparency “from farm to fork,” so we were thrilled to have the opportunity to give them both a tour and a tasting. We put out cheeses from both ends of the age spectrum: Welsh Cheddar, aged three months, and Tumbleweed, aged 14 months. The contrast between taste and texture is the perfect example of the difference between a young cheese and one that is more mature. 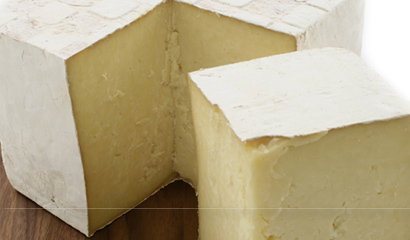 Welsh Cheddar is mild and buttery with a creamy texture. It’s a great melting cheese and has even been the main ingredient for a delicious dessert- Welsh Cheddar Bavarian- at Post 390 in Boston. Tumbleweed, which is a cross between a young Cantal and an aged cheddar, perfectly accentuates dishes like risotto, Brussels sprouts, salad, or eggs, but to get the full Tumbleweed experience, it’s best to eat it on its own. 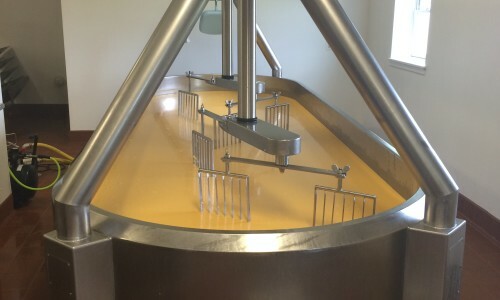 We divided up the group and showed them three different parts of the cheese-making process. They picked a great day to visit because they were able to see the beginning and middle stages of our newest cheese, a mimolette. We started off in the vat room, where the group saw the milk warming up. 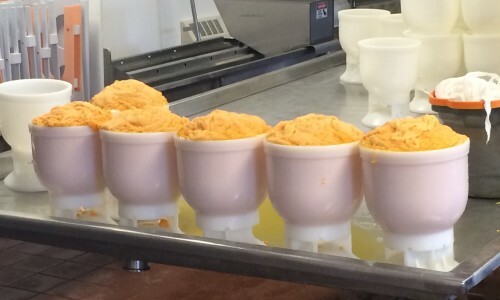 Check back with us soon to see a video of the making of the mimolette. Next to the vat room is the brine room. After the mimolette is pressed, it goes to the brining room for several days to sit in the salt brine. 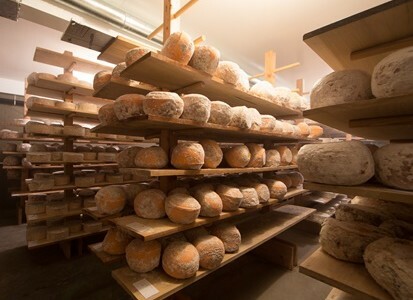 The brine room also serves as a refrigerator for our cheeses that are ready to go. We had some of our Redmond cheddar in there yesterday. We rounded out the day’s focus on local farmers by inviting our neighbors from Orange County Distillery, who provided samples of their spirits from their farm-to-bottle distillery. Thanks for stopping by, @WholeFoodsParamus. We’ll let you know when our mimolette video is ready. To whet your appetite, here’s a picture of our mimolette before it gets pressed.